'Bachelor in Paradise' was a wild ride for the contestants and viewers. While there is a lot that happens in the process, it comes down to the final couples. I have ranked them in order of my favorites and why. 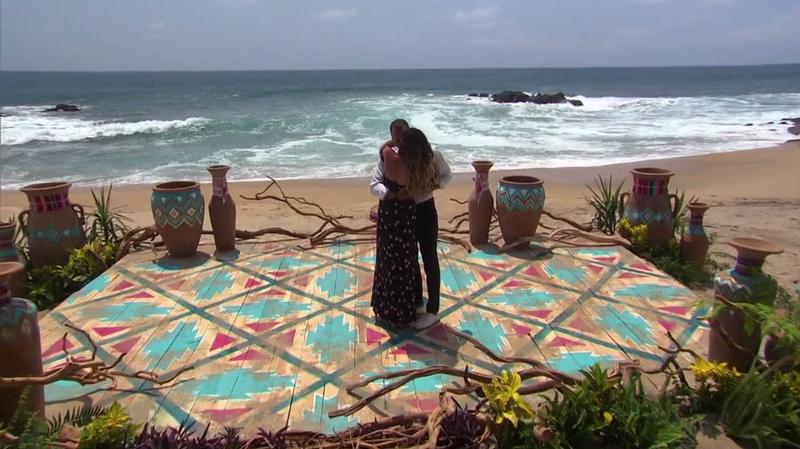 When Evan Bass showed up on Bachelor in Paradise, it seemed that it was for the sole purpose of having a Chad vs. Evan fight 2.0. However, Evan seemed to find interest in Carly Waddell and Amanda Stanton, and no one reciprocated. Carly said some harsh comments about Evan that made us believe there was no hope for the couple. In true Evan fashion, it only took one date to the hospital for him to have a chance. Ever since, they were getting along, Carly was attracted to them and they ended up being the most liked couple in paradise. If anyone can learn something from this season, it is give anyone a chance even if they are not your type. You never know where your Evan may be out there in the world. This couple was the king and queen of ups and downs. Lace Morris started the season out with her Chad relationship and that fizzled out in a hurry. Then when Grace happened, Lace was still very uncertain about the situation. 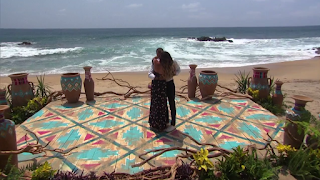 Through the fantasy suite and tattoos, the result still seemed unclear, but when it came down to the finale, an engagement happened. I don't know how I feel about this combination of personalities, but I wish them the best. Josh Murray showed up on his apology tour, post-Andi's book reveal. There was so much controversy with Nick Viall being on the show and 'vying' for the same woman. While that didn't last long, the dislike for Josh remained. There was a lot of talk concerning his temper and reasoning for being on the show. Amanda didn't seem worried, even though Josh was quick-tempered regularly through the show. I hope that was just the environment and they are happily engaged. Unfortunately, we knew a week in advance that Jen and Nick would not leave together happily ever after. Therefore, I included Nick + 25 women in my poll, and they made second. Check out my next post for my thoughts on him getting 'The Bachelor' role. Who is your favorite couple? 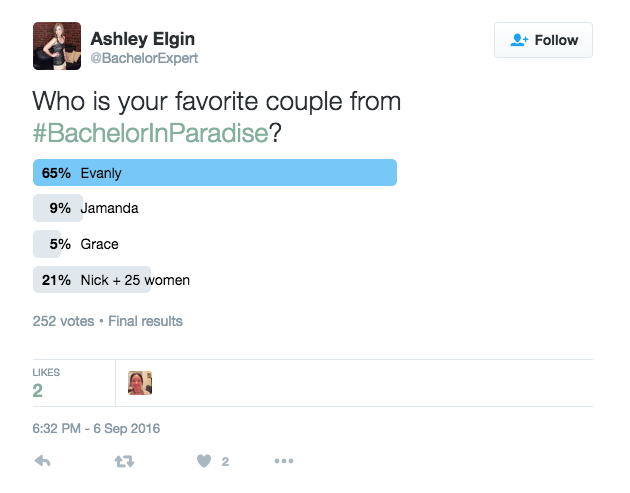 According to Twitter, Evanly was a strong first with Nick + 25 women in second, and then Jamanda and Grace. All image rights belong to ABC/Disney.